I have no need for religion, I have a conscience. I have something to say to the religionist who feels atheists never say anything positive: You are an intelligent human being. Your life is valuable for its own sake. You are not second-class in the universe, deriving meaning and purpose from some other mind. You are not inherently evil--you are inherently human, possessing the positive rational potential to help make this a world of morality, peace and joy. Trust yourself. He that will not reason is a bigot; he that cannot reason is a fool; he that dares not reason is a slave. The God of the Old Testament is arguably the most unpleasant character in all fiction: jealous and proud of it; a petty, unjust, unforgiving control-freak; a vindictive, bloodthirsty ethnic cleanser; a misogynistic, homophobic, racist, infanticidal, genocidal, filicidal, pestilential, megalomaniacal, sadomasochistic, capriciously malevolent bully. According to the Big Bang model, the Universe expanded from an extremely dense and hot state and continues to expand today. A common analogy explains that space itself is expanding, carrying galaxies with it, like raisins in a rising loaf of bread. The graphic scheme above is an artist's concept illustrating the expansion of a portion of a flat Universe. Monsignor Georges Henri Joseph Édouard Lemaître a Roman Catholic priest and professor of astronomy and physics published a paper in the Annals of the Scientific Society of Brussels with the title A homogeneous Universe of constant mass and growing radius accounting for the radial velocity of extragalactic nebulae. His paper described an expanding universe, beating Edwin Hubble by 2 years, and provided the first observational estimation of what became known as the Hubble constant. Lemaître didn’t realize what would happen if you ran is theory of an expanding universe backwards but 4 years later he introduced his Hypothesis Of The Primeval Atom which later became known as the Big Bang Theory due to a sarcastic comment by Fred Hoyle since this directly contradicted his pet steady state theory. Hoyle’s main objection was that the Big Bang Theory implied a creator, as in the Kalam cosmological argument, while the steady state theory didn’t. That objection, although it gave us a nicer name than Hypothesis Of The Primeval Atom, was based on a faulty assumption. 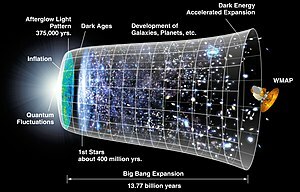 The Big Bang does not state that the universe was created ex nihilo, as a large number of creationist believe, but it says there was an expansion of the universe. Creation ex nihilo is something creationists and particularly the Jehovah’s Witnesses claim but it is not something claimed in science since it is a clear violation of the first law of thermodynamics. As far as the universe being finite or infinite, once again a creation of the universe ex nihilo is an untenable position. 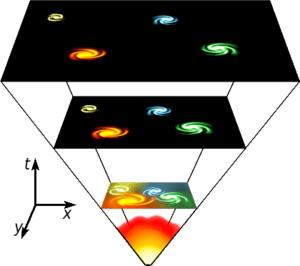 Run the expansion backwards and you do come to a point commonly called the singularity, a ‘point’ where general relativity gives us infinite density and infinite temperature [general relativity breaks down at this ‘point’]. As Lemaître thought, when the universe was contracted to this ‘point’ space and time didn’t exist. Lemaître was wrong. Spacetime, at least spacetime as we know it, didn’t exist but the Big Bang was an expansion so spacetime or should I say prespacetime was present. Curiously enough this can be seen by considering an infinite universe. If the universe after the Big Bang and it’s ensuing inflation is infinite, then it must have started as infinite. The same can be seen with a finite universe only it is somewhat harder to see than with an infinite universe. That is the reason you see the word point, when I refer to the singularity, surrounded by inverted commas. Steady State Theory is no longer a theory given any credence in scientific circles. The last nail in its coffin was the discovery of the Cosmic Microwave Background Radiation in 1964 by Arno Penzias and Robert Wilson. This a really great article in explaining the Primeval Atom Theory/Big Bang theory. My only issue is what caused the Big bang to explode and what caused it to exist in the first place?